Whether you’re an avid reality television viewer or a follower of eco-fashion, the name Daniel Silverstein is probably on your radar. The charismatic, near-prodigy level graduate of the Fashion Institute of Technology (whose portfolio was lauded when he was only 14 years old) and finalist of NBC’s Fashion Star, is pioneering a new realm of design, one that benefits people and the planet. Ecouterre sat down with Daniel and his brand manager and longtime friend, Chris Anderson, after his Fall/Winter 2014 presentation at Launch NYC Fashion Week to talk about his start, the label’s past four years, and the future of sustainable fashion. Let’s start at the beginning. How did you become interested in fashion? Silverstein: All I ever wanted to do was be a designer in NYC, but there weren’t many options for a 16-year-old boy in Madison, New Jersey. I had been taking weekend classes at FIT for several years during high school and they had told me a couple of times, “you have a portfolio that we would accept now, but we can’t consider you until you have a high school diploma.” I participated in a student volunteer program so I could graduate sooner and give back to the community. And that’s how I met Chris. Anderson: I was the executive director of Dress for Success in Madison and Daniel was my intern. We worked on a vintage-inspired fundraiser fashion show together, and became friends from there. The theme was “Workwear from the Last Century.” And Daniel did a design for 2050; it was incredible. Silverstein: We did so many things to bring that event together. We had high school students in the community model the designs. We made handbags. The event was a tremendous success and we had so much fun doing it that we were like, whoa, we’re pretty good at bringing concepts together and fundraising; we should do this more often. What was the trajectory from that Dress to Success event to Daniel Silverstein the label? Silverstein: I had run in to Chris again shortly after I graduated from F.I.T. I was working at a giant corporate company and not really loving it. Good product, good people who taught me a lot, but I couldn’t see myself making an impact there. One of the meetings I had the privilege of sitting in on was on costing, and a primary element that drives up the cost of a garment is how much fabric you use. The company was using traditional pattern cutting and sewing and there was a lot of wasted material. And it kind of clicked for me there. We were using wasteful traditional patterns, cutting out tons of fabric in a mill in China, throwing 15 percent or more of that fabric away, and charging people because our consumption was irresponsible. So when I saw Chris, I said, “I really think I can make these zero-waste patterns that fit together like puzzle pieces, and that’s how we’re going to make clothes. I think it’s the future.” Every production run wastes thousands of yards of fabric. That’s not a little bit. What are we doing to the earth? And who’s making it, and in what conditions…? Silverstein: Exactly. And what is the toll of those materials? All of those things matter. What was the initial aim of the label? And what is the primary message now? Silverstein: We set out with a pretty lofty goal: We wanted to be everything to everyone. The line was going to be vegan, organic, zero waste, everything. And as we began to speak with people in the fashion realm about the line, we realized that with the industry being what it is right now, we needed to focus our message. Eventually, we will be able to make Daniel Silverstein everything we want it to be. But right now, our mission is to make wearable zero-waste clothing. Some of our pieces are organic. Some are made from recycled material. Some are conventional materials. They run the gamut. But everything is zero waste or less than one percent. You’re known as the evangelist of “zero waste” design. What does the term mean, exactly? Silverstein: Zero waste means that very time we cut fabric, we use the entire piece to make that garment. So, instead of having leftovers, there’s little-to-no byproduct. For some techniques, it’s inevitable to have a small amount of scrap fabric, but we never throw those away. The minimal scraps we do have – and I mean minimal – we use for other projects. We are working on a rug for our studio space using scraps. We tie bundles with scraps. We donate to a designer who only works with reclaimed materials. Scraps are never thrown away. Silverstein: (Gestures to studio) Everything is made in there. By hand. Here in the U.S.A.
You’re a handmade in the U.S.A., zero-waste label; that ticks a lot of boxes. Silverstein: This is something else I could talk about at length. There’s a lack of understanding and respect for a skill in our country. Fashion is a lot like food. It’s something you put on your body. Food, clothing, and shelter are our basic needs, and we don’t really value the people who cook or clean or make clothes for us, and we’re always looking for ways to further cheapen those trades. Most of fashion is done offshore, by people who are exploited or aren’t taught the trade. I am really passionate about creating a safe place for people who want to work with their hands and forge a career to come and work. So, through the label, you want to expand opportunities for artisans and designers in the industry? Silverstein: Absolutely. When I graduated from FIT in 2010, I was in the top 10 of my class with honors. I went on interview after interview and could not find a job. It was through that process—and seeing hundreds of other eager, talented people like me struggle—that I realized how broken the fashion industry is. From not having opportunities for people who want to work, to not valuing the craft, to not educating the consumer, there are so many areas that need improvement. We are even in the early stages of creating a program with at-risk high school youth who are interested in working in fashion, and that is going to be exciting. You’re dressing some of the most influential people in the eco-fashion movement right now: Amber Valletta, for instance. And your star is continually rising. Do you think you’re going to be able to maintain this commitment to zero waste as the label grows? Silverstein: I took one key opportunity in my career to compromise my belief system, and it was for the greater good. On Fashion Star, I didn’t do a single zero-waste piece because I had very little control over the production and significant time constraints were placed on contestants. I am very confident in saying that that is the last instance where I will do any sizable production that is not zero waste. I really believe in this. I don’t think it makes any sense for a young person in the industry who feels like they can affect change to compromise their beliefs just so they can have a nicer apartment or whatever. Anderson: We’ve had many opportunities over the past four years to compromise our commitment to make things faster, easier, more profitable. And we haven’t done those things. Zero waste is the thing that we keep black and white. It’s what we stand on. It’s immovable. It’s our North Star. Silverstein: Exactly. We’ve said no to those proposals and I think saying no will just keep getting easier as we evolve as a brand. What inspires you to hold fast to the ideal of zero waste? I just turned 25 and I feel like I’m this weird, young designer holed up in his NYC studio saying, “One day, everything we make will be zero waste!” And the nay sayers will roll their eyes at me. And then, someday in the future, everything really will be zero waste. So, you’re making your dream a self-fulfilling prophecy. That’s pretty revolutionary. Silverstein: Totally. You have clothes in this room that we’re sitting in that you can wear to every aspect of your life. A cocktail dress. Shorts. A wedding dress. Pants. It’s all made responsibly, and you can have it all this way. Anderson: And I feel like the trend is our friend, too. There are some more established companies who are starting to make moves toward sustainability and it’s becoming more acceptable. Silverstein: We have the privilege of working with Amber Valletta who is majorly successful and she’s even said that what we’re doing is revolutionary. Sometimes it takes, not a young mind, but fresh goals. My goals are not to be Versace, my goal is to change the way people make clothes. I don’t want to work in an industry that is poisoning the world. Let’s talk about this most recent collection you presented at Launch NYC. What was the inspiration? Silverstein: We were so fortunate to partner with Manufacture New York and Launch NYC for this presentation. One of the anchoring prints in the collection is from one of my sketches and it turned out great. There’s much of my signature draping and embellishment. And there’s a piece for every aspect of a woman’s life. I always aim to create designs that women can wear for every occasion and feel confident and comfortable in. What are your goals for the label 10 years from now? Silverstein: Obviously, I would love to have this brand explode. I’d love to have people appreciate my designs and also feel good about the ethics of the product. I also really want to collaborate with one of the exclusive, luxury, high-profile labels that is way above the price point that I’m working in and show them that they can still have their audience and aesthetic while making a zero-waste product. Because you can have this at H&M or Chanel. It’s a philosophy. It’s a way of pattern-making and cutting and thinking. It’s not a price point. It’s not a look. Any designer could do this. Anderson: People just need the suggestion. And once they ruminate on it, their thinking starts to change. More than anything, people fear that you’re being pedantic and you’re saying, “You have to live this way.” What we’re doing is showing people that there’s an alternative and it’s not only zero waste, it’s zero sacrifice. Silverstein: People will eventually have to care about making garments sustainably because of the environmental toll of fashion. So whether fashion houses actively embrace or have to comply with zero waste, I want to be there to show them how zero waste can work. For anyone who wants to listen: Here I am; I want to talk. Whether you're an avid reality television viewer or a follower of eco-fashion, the name Daniel Silverstein is probably on your radar. 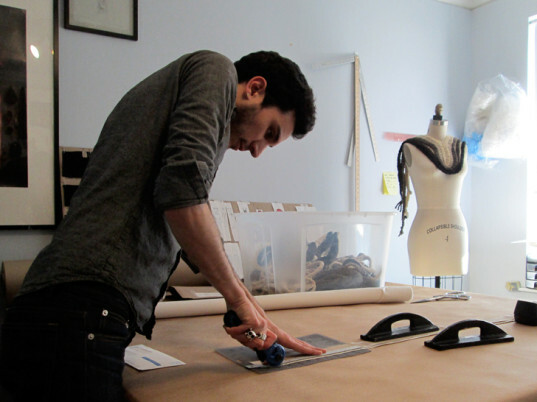 The charismatic, near-prodigy level graduate of the Fashion Institute of Technology (whose portfolio was lauded when he was only 14 years old) and finalist of NBC's Fashion Star, is pioneering a new realm of design, one that benefits people and the planet. Ecouterre sat down with Daniel and his brand manager and longtime friend, Chris Anderson, after his Fall/Winter 2014 presentation at Launch NYC Fashion Week to talk about his start, the label's past four years, and the future of sustainable fashion.